Since August, media reports listed about nine rounds of oil price rollbacks that have pulled down pump prices of gasoline products by P10.50 per liter and kerosene and diesel prices by P8.50. Prior to the series of oil price rollbacks since August, the last monitored round of price reduction was reported on July 21, a week before the annual State of the Nation Address (SONA) of Ms. Gloria Arroyo. What has caught public attention in the latest rounds of rollbacks is the noticeably larger reductions that small player Unioil has implemented. While its competitors, including the Big Three, have reduced their pump prices by a total of P3 per liter last Sep 11 and 18, Unioil implemented a total rollback of P6 per liter for its gasoline products and P4 for its diesel and kerosene. The oil firm explained that it “will always reflect true prices based on market forces, supply and world oil prices for the ultimate benefit of the consuming public”. Unioil also said that higher price reductions will also significantly boost its sales. There is a general consensus that the rollbacks in local pump prices have not been proportionate to the rapid decline in world oil prices with the Big Three taking the brunt of public criticism. Malacañang has not only publicly questioned the obvious gap in global and local price movements but even called for an “independent” audit of the Big Three through the Department of Justice (DOJ). The audit team shall be headed by the dean of the College of Accountancy of the University of the Philippines (UP) with certified public accountants from the DOJ, Department of Energy (DOE) and Department of Trade and Industry (DTI) as members. Meanwhile, Senate majority floor leader Francis Pangilinan has asked the public to boycott the Big Three as “one way of sending a message to the big companies to be sensitive to the plight of consumers” and for “their ‘obvious collusion’ to delay the lowering of oil prices”. However, calling for an independent audit of the oil firms may prove futile. This is not the first time that the government has ordered an audit of the oil companies by an “independent” body. The most recent was a DOE-commissioned study done by Peter Lee U, economics dean of the University of Asia and the Pacific (UA&P). The audit covered Petron and Shell, which together control some 70% of the local market and was verified by the SGV Co. Conducted amid the weekly oil price hikes in the second quarter of the year, it found out that supposedly “the oil firms have been reasonable in their increases”. The basic problem with the government-initiated audits of oil firms is that they fail to look at the more important aspects of the industry that could help determine whether oil price levels and adjustments are reasonable or not. This is not simply because the audit teams may be incompetent but because under deregulation, oil firms could not be compelled to disclose certain aspects of their business operation in the spirit of “confidentiality and competition”. The demand for a substantial rollback that will truly reflect rapidly declining global prices, on the other hand, enjoys wide public support including from the mainstream media. The obviously big disparity in the price levels of local pump prices relative to global prices have put the oil companies on the defensive. As of September 26, the monthly average of Dubai crude is pegged at $96.49 per barrel, which is about the same level of its March average of $96.76. Meanwhile, as of September 26, the average pump price of unleaded gasoline is about P52.21 per liter while that of diesel is around P51.19. In March, their respective averages were P45.33 and P38.31 or a difference of more than P9 per liter for unleaded gasoline and almost P15 for diesel. But note also that the peso has lost P3.87 of its value against the US dollar between March and September. However, such approach still does not consider the monthly changes in Dubai crude and foreign exchange in other months from January to September. Oil firms may use this as a justification for their pricing behavior because they may claim under-recoveries in certain months which they say the need to recoup. 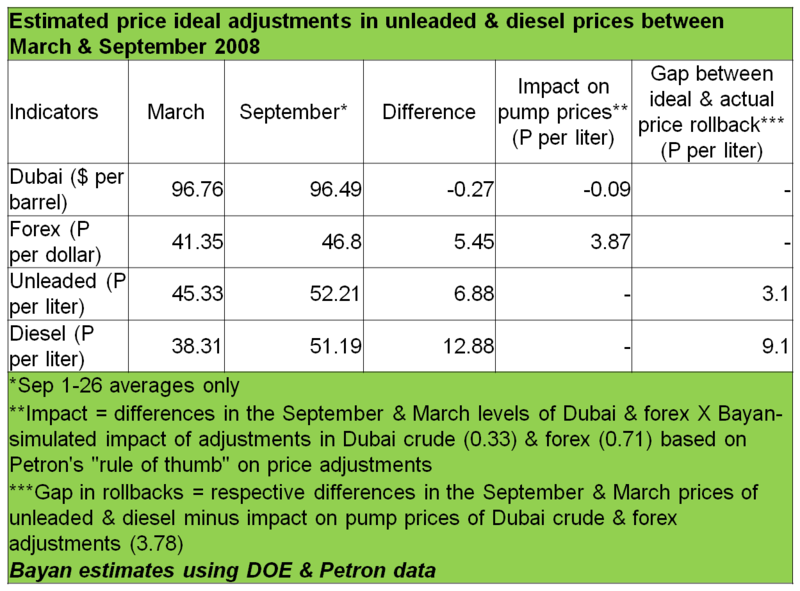 Thus, computing the estimated net effect of the monthly movement in Dubai crude and forex on pump prices could be the more accurate approach in estimating the ideal oil price rollback. 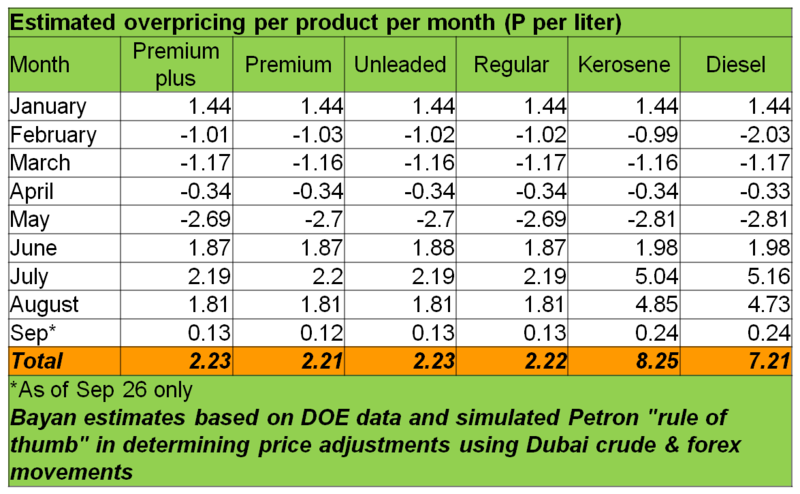 Simulating the “rule of thumb” used by Petron in determining the impact of monthly changes in Dubai crude and forex on local pump prices and comparing them with the actual price adjustments per month as reported by the DOE, it appears that diesel prices are “overpriced” by P7.21 per liter; kerosene, P8.25; and gasoline products by P2.21 to 2.23. This means that oil companies have implemented oil price hikes than what the adjustments in Dubai crude and forex warrant from January to September. A major limitation of this estimate is that it does not factor in the impact of speculation and monopoly pricing by the oil TNCs and in fact assume that global spot prices reflect the true cost of oil (which in reality is not the case). Another limitation is that it uses only Dubai crude as benchmark, while oil firms claim that they also use the MOPS as benchmark in computing pump prices for their imported finished petroleum products. While it does not use the MOPS, it can still be argued that the pump prices of imported finished products is nonetheless traceable to the price of crude oil. They should be compelled to rollback prices by these amounts if only to offset their “overpricing” from January to September, on top of whatever price adjustments that they will implement in October and beyond. → Senate railroaded JPEPA, who’s surprised? I don’t even believe that all of these oil products paid the corresponding VAT to the Phil gov’t. A simple thinking would simply trace the amount of VAT that would be collected by the BIR everyday. There are 50 million motorists nationwide, consuming more than 50 million liters of gas, crude, whatever, each liter is charge not less than 5pesos, by multiplication that would run to 250 million pesos VAT everyday. 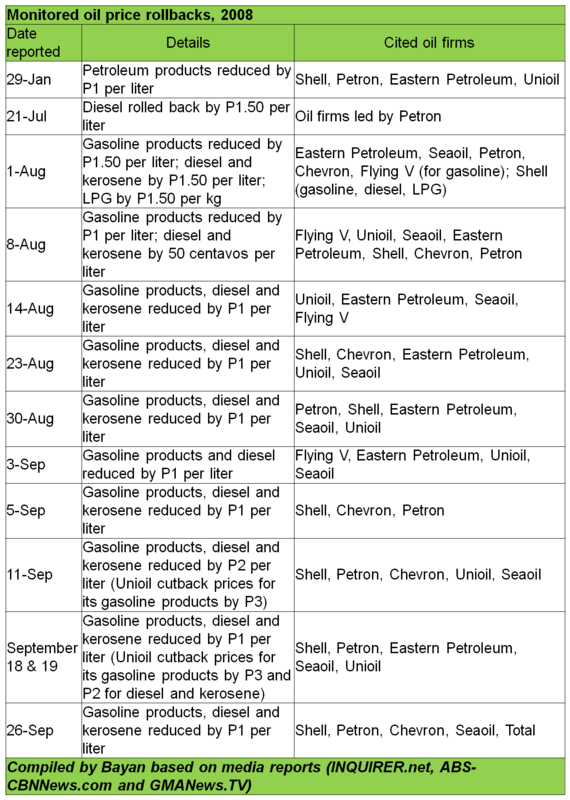 In one year that will reach to 91,250,000,000.00. That 91 billion, that only motorists consumption, which partakes barely 50% of the total consumption of oil in our country. Tell this to Kim Henares, gas stations in the country had multiplied their number tremendously, bcoz of unremitted VAT paid by consumers. Sir Arnold, Tell me if I’m wrong in my estimate. Hi, yes that’s one way of arriving at a ballpark.